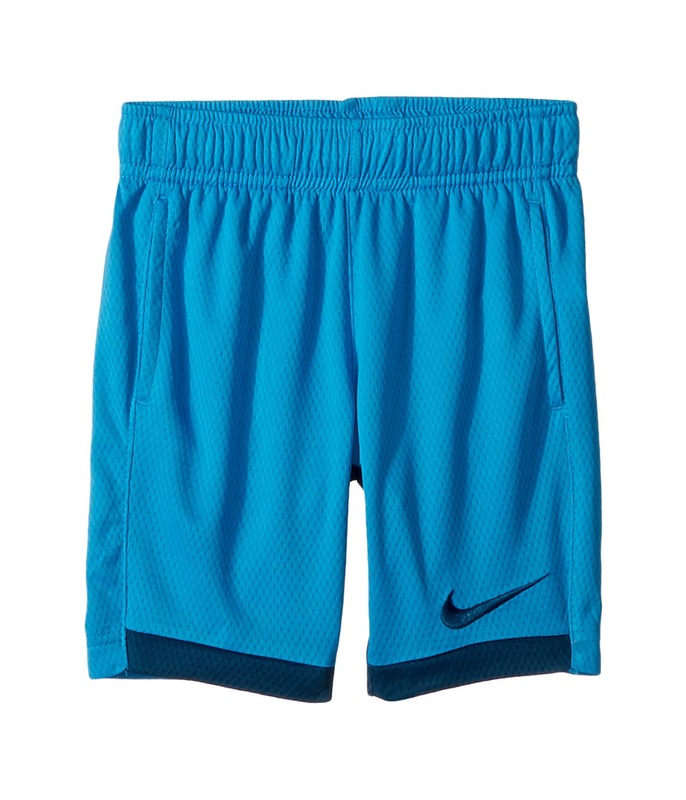 Get into training mode and don~t sweat the small stuff in these comfy Nike Kids Dry Trophy Shorts. Athletic fit is eased, but not sloppy, and perfect for any activity. Dri-FIT technology wicks perspiration towards the fabric surface where it can evaporate. Lightweight, textured poly-weave offers optimal comfort and breathability. Stretch waistband with adjustable interior drawstring. Welt hand pockets. Embroidered Swoosh at lower left. Colorblocked straight hem. 100 percent polyester. Machine wash, tumble dry. Imported. Measurements: Waist Measurement: 18 in Outseam: 11 in Inseam: 5 in Front Rise: 7 in Back Rise: 8 in Leg Opening: 6 in Product measurements were taken using size 3T Toddler. Please note that measurements may vary by size. 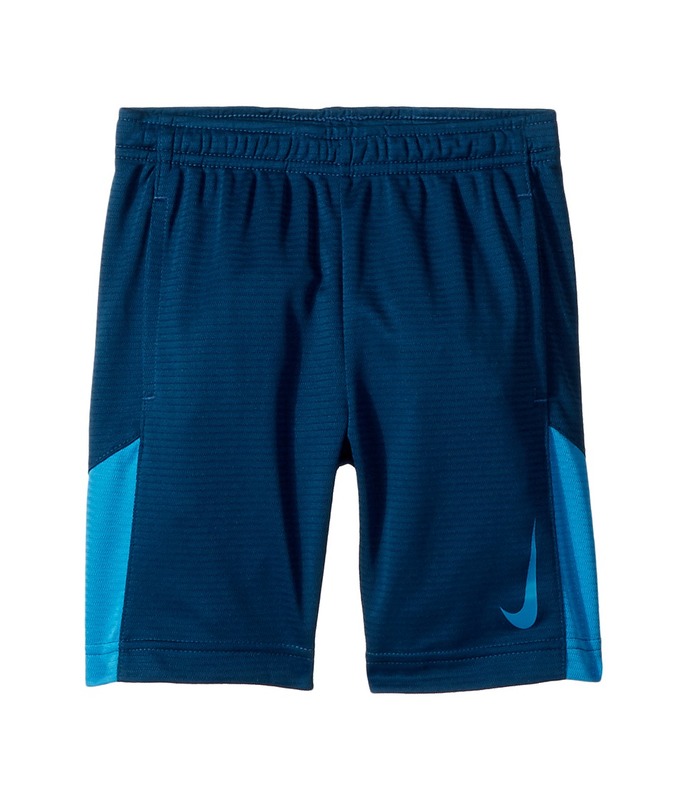 Get into training mode and don~t sweat the small stuff in these comfy Nike Kids Dry Trophy Shorts. Athletic fit is eased, but not sloppy, and perfect for any activity. Dri-FIT technology wicks perspiration towards the fabric surface where it can evaporate. 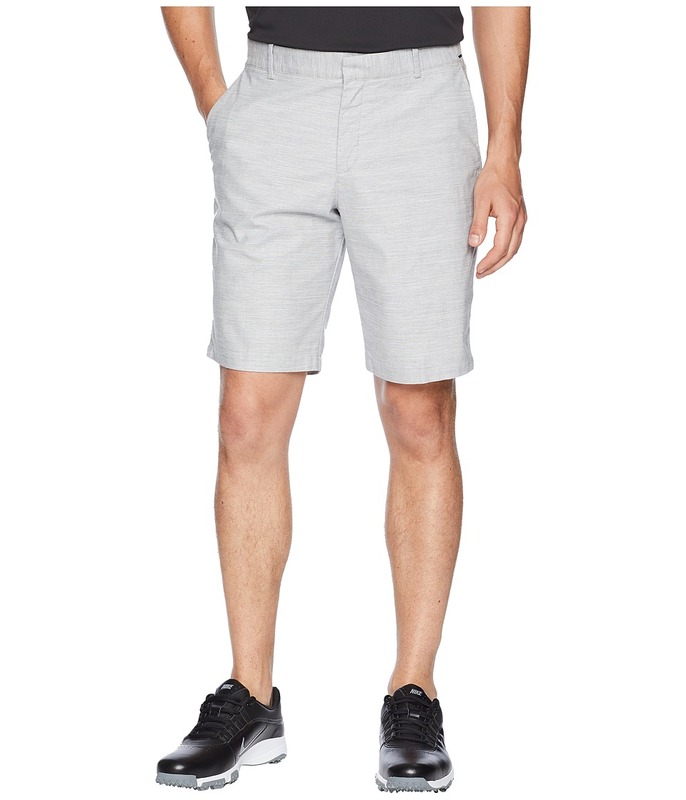 Lightweight, textured poly-weave offers optimal comfort and breathability. Stretch waistband with adjustable interior drawstring. Welt hand pockets. Embroidered Swoosh at lower left. Colorblocked straight hem. 100 percent polyester. Machine wash, tumble dry. Imported. Measurements: Waist Measurement: 20 in Outseam: 12 in Inseam: 5 1 2 in Front Rise: 7 1 2 in Back Rise: 8 in Leg Opening: 13 in Product measurements were taken using size 5 Little Kids. Please note that measurements may vary by size. 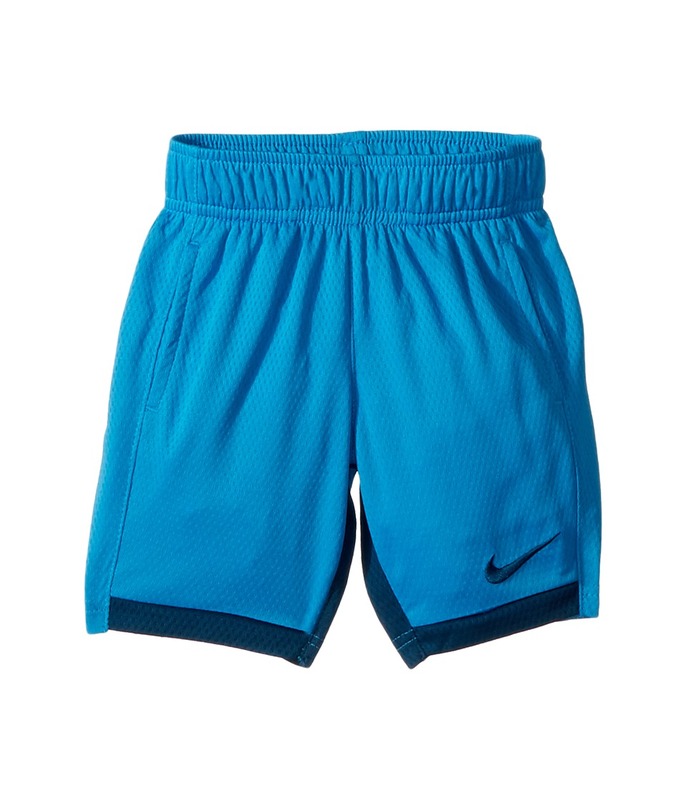 Move towards your goals and excel to be the best in these comfy Nike Kids Accelerate Shorts. Regular fit is eased, but not sloppy, and perfect for any activity. Elastic waist with interior drawstring provides a secure fit. On-seam hand pockets. Colorblocked sides lend a modern finish. Straight hem. 100 percent polyester. Machine wash, tumble dry. Imported. Measurements: Waist Measurement: 21 in Outseam: 13 in Inseam: 6 in Front Rise: 8 in Back Rise: 9 in Leg Opening: 16 in Product measurements were taken using size 6 Little Kids. Please note that measurements may vary by size. 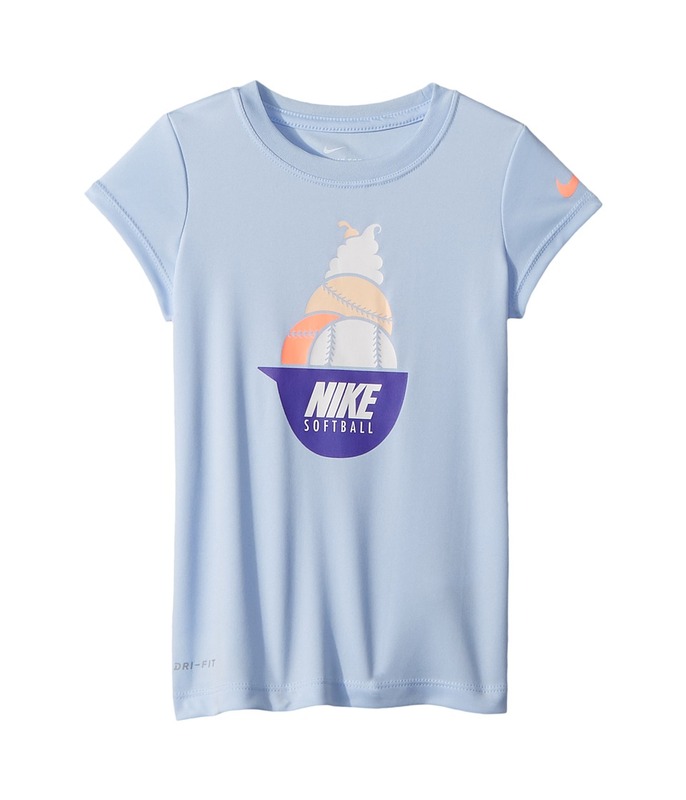 She~s sure to add some color to her day by playing in the yard with this sporty Nike Kids Softball Sundae Training Short Sleeve Tee. Relaxed fit t-shirt drapes the body and offers freedom of movement. Dri-FIT technology wicks perspiration towards the fabric surface where it can evaporate. Lightweight poly-knit adorns colorful softball print with brand marking across center front. Crew neck. Short-sleeve coverage. Straight hem. 100 percent polyester. Machine wash, tumble dry. Imported. Measurements: Length: 17 in Product measurements were taken using size 4T Toddler. Please note that measurements may vary by size. 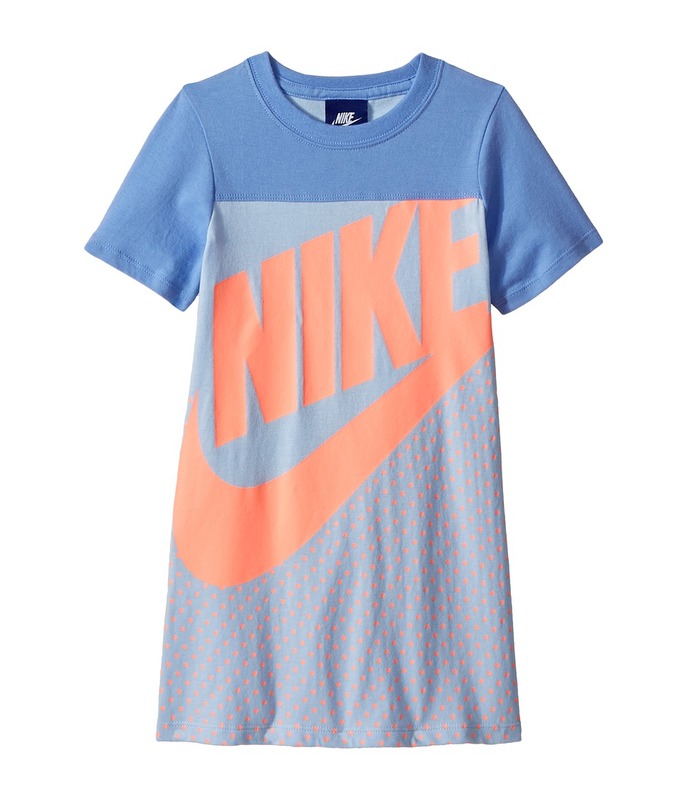 Let her lounge in comfort by slipping on this sporty Nike Kids Sportswear Jersey GFX Dress. Relaxed fit T-shirt dress drapes the body with a modern cut. Superbly-soft weave boasts a colorblocked design. Slip-on styling. Ribbed-crew neck. Short-sleeve coverage. Brand marking hits nape. Large Swoosh screened across front with polka dot pattern. Straight hem. 100 percent cotton. Machine wash, tumble dry. Imported. Measurements: Length: 22 in Product measurements were taken using size 4 Little Kids. Please note that measurements may vary by size. 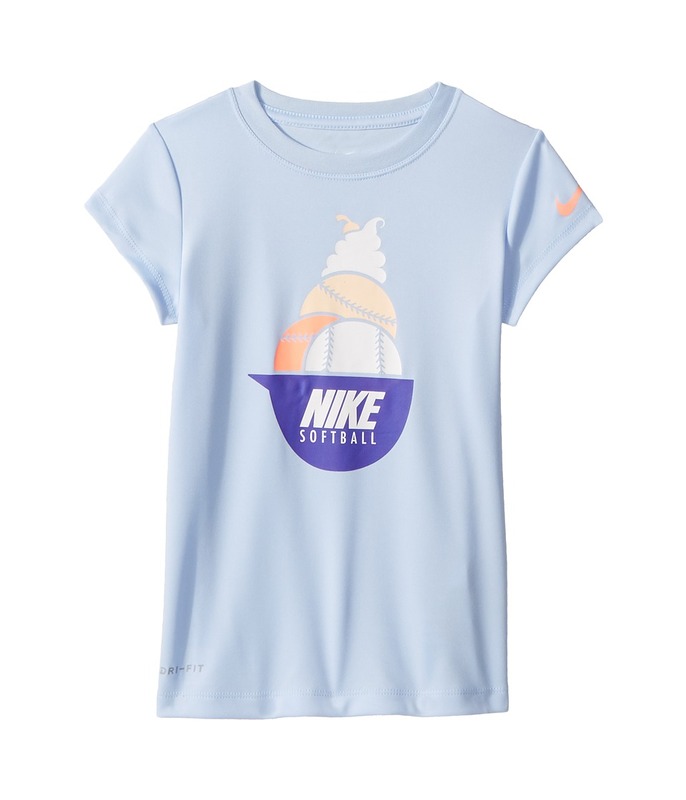 She~s sure to add some color to her day by playing in the yard with this sporty Nike Kids Softball Sundae Training Short Sleeve Tee. Relaxed fit t-shirt drapes the body and offers freedom of movement. Dri-FIT technology wicks perspiration towards the fabric surface where it can evaporate. Lightweight poly-knit adorns colorful softball print with brand marking across center front. Crew neck. Short-sleeve coverage. Straight hem. 100 percent polyester. Machine wash, tumble dry. Imported. Measurements: Length: 18 1 2 in Product measurements were taken using size 6 Little Kids. Please note that measurements may vary by size. 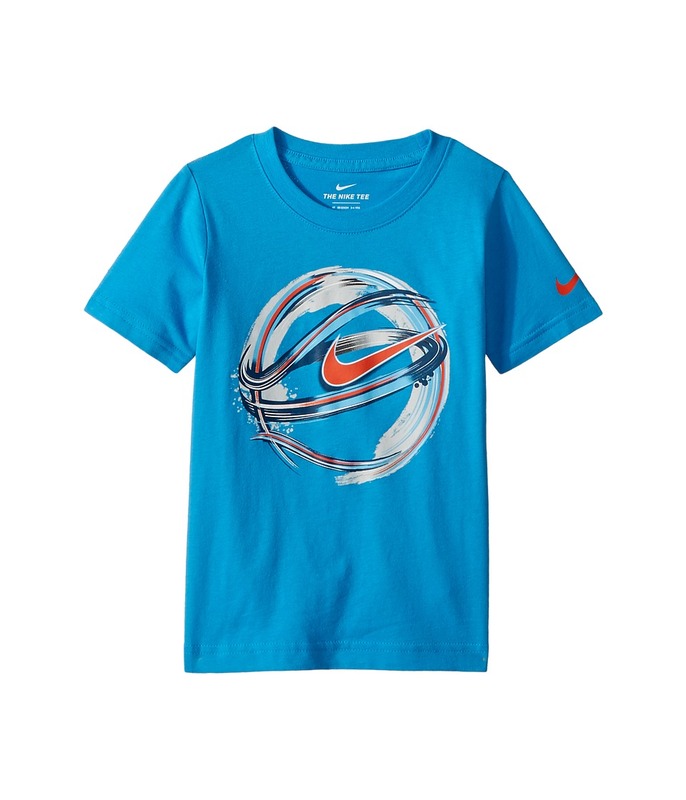 Move swiftly through the day in this sharp Nike Kids Brush Basketball Cotton Tee. Athletic fit is eased, but not sloppy, and perfect for any activity. Dependable cotton knit provides breathable, lightweight wear. Ribbed crew. Short sleeves with brand marking at left cuff. Large basketball screened across front with Swoosh marking. Straight hemline. 100 percent cotton. Machine wash, tumble dry. Imported. Measurements: Length: 17 1 2 in Product measurements were taken using size 4T Toddler. Please note that measurements may vary by size. Keep your passion for running alive with the lightweight Nike Flex Experience RN 7 shoes. Predecessor: Flex Experience RN 6. Support Type: Neutral to underpronation (supination). Cushioning: Light, flexible response. Surface: Road. Differential: 6mm. Lightweight mesh upper with no-sew synthetic overlays is designed for a streamlined, sock-like fit. Lace-up closure. Low-cut profile. Lightly padded tongue and collar. Breathable fabric lining. Foam insole. Injected foam midsole doubles as an outsole, supplying lightweight comfort. Hexagonal flex grooves promote a more natural underfoot feel. Imported. Measurements: Weight: 10 oz Product measurements were taken using size 10.5, width 4E - Extra Wide. Please note that measurements may vary by size. Weight of footwear is based on a single item, not a pair. He~s always on the go! Keep little feet cool and dry in the Nike Kids JDI Crew Socks. Sold as a pack of three. Dri-FIT fabric helps pull away sweat to help keep feet cool and dry. Arch compression for a supportive fit. Anatomically designed for a better fit. Ribbed cuff for a snug fit. Swoosh logo at cuff. Reinforced heel and toe for durability. 75 percent cotton, 23 percent polyester, 2 percent elastane. Machine wash cold, tumble dry low. Imported. 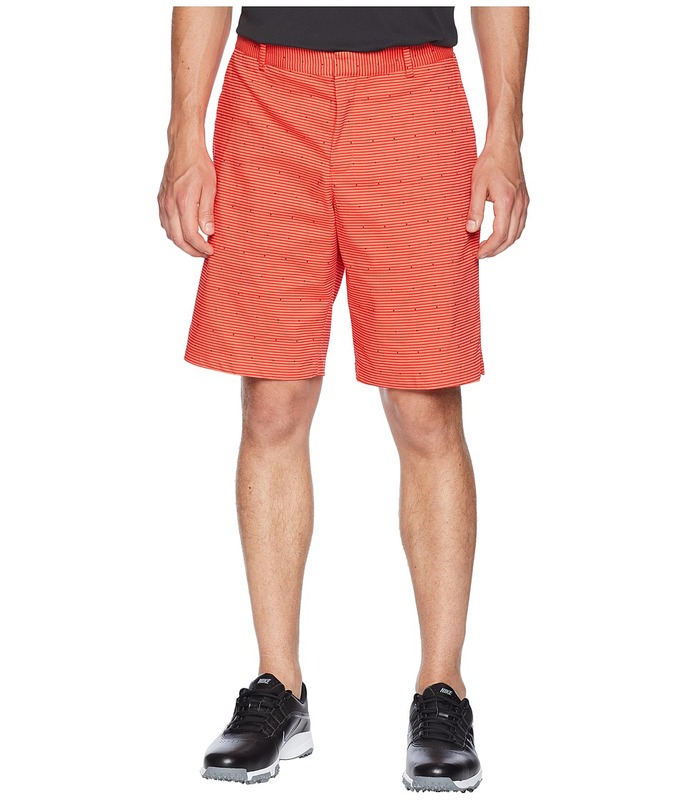 Strut the fairway with epic style in the Nike Golf Flex Shorts. Slim fit hugs the body while still leaving room for movement. Nike Flex four-way stretch fabric provides a wider range of movement and enhanced comfort. Belt loop waistband. Hook-and-bar closure with zip fly. Four-pocket design. Swoosh logo at rear-right waist. Notched sides. 51 percent cotton, 45 percent polyester, 4 percent spandex. Machine wash, tumble dry. Imported. Measurements: Waist Measurement: 34 in Outseam: 21 in Inseam: 11 in Front Rise: 12 in Back Rise: 14 in Leg Opening: 11 in Product measurements were taken using size 34, inseam 11. Please note that measurements may vary by size. Tee up with sleek, high-performance swagger in the Nike Golf Flex Shorts. Slim fit hugs the body while still leaving room for movement. 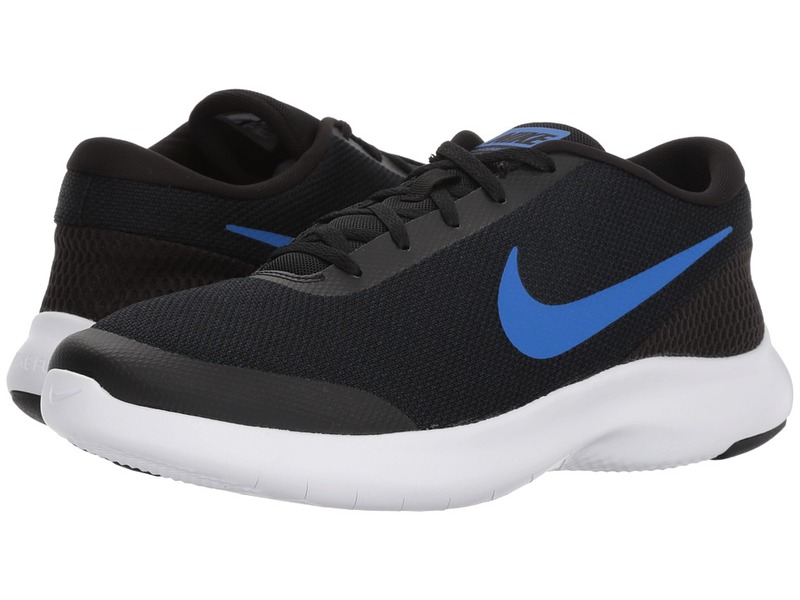 Nike Flex four-way stretch fabric provides a wider range of movement and enhanced comfort. Dri-FIT technology wicks perspiration towards the fabric surface where it can evaporate. Belt loop waistband with inner-textured taping that keeps your shirt tucked in. Button closure with zip fly. Four-pocket design. Swoosh logo at rear-right waist. 51 percent cotton, 45 percent polyester, 4 percent spandex. Machine wash, tumble dry. Imported. Measurements: Waist Measurement: 32 in Outseam: 20 in Inseam: 11 in Front Rise: 11 in Back Rise: 13 in Leg Opening: 12 in Product measurements were taken using size 32, inseam 11. Please note that measurements may vary by size.